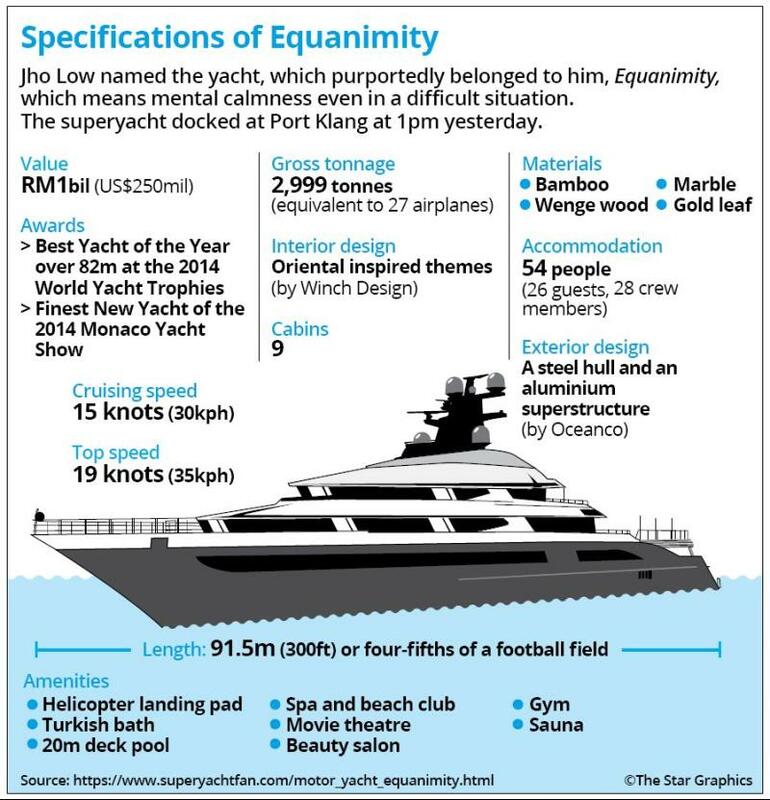 KUALA LUMPUR: Super yacht Equanimity of fugitive financier Low Taek Jho (Jho Low) fame, was bought using four tranches of funds totalling US$262.4 million misappropriated from 1Malaysia Development Bhd (1MDB) between January and June 2014, according to lawyers representing the Malaysian government who “arrested” the billion-ringgit vessel in Port Klang yesterday. Two days after getting the loan, 1MEHL transferred most of the cash to Aabar BVI (British Virgin Islands), also known as the fake Aabar. The money then went through Affinity Equity and Alpha Synergy before reaching Jho Low, who on June 3, 2014 transferred US$140.6 million to WorldView for the fourth and final payment of the yacht. The earlier three tranches originating from 1MDB also went to WorldView. “WorldView Ltd is a family trust of which only the Low family are beneficial owners of,” according to Low’s email in June 2015 to a lawyer at Hill Dickinson LLP and a senior BSI banker cited in the 251-page filing by the US Department of Justice (DoJ) in June 2017 to seize 1MDB assets, including the Equanimity. The same filing said Jho Low and his parents Low Hock Peng (LHP) and Evelyn Goh Gaik Ewe on Sept 9, 2013 flew from Barcelona to Rotterdam — near where the Equanimity was being built — to view the shipyard and the yacht the following day. 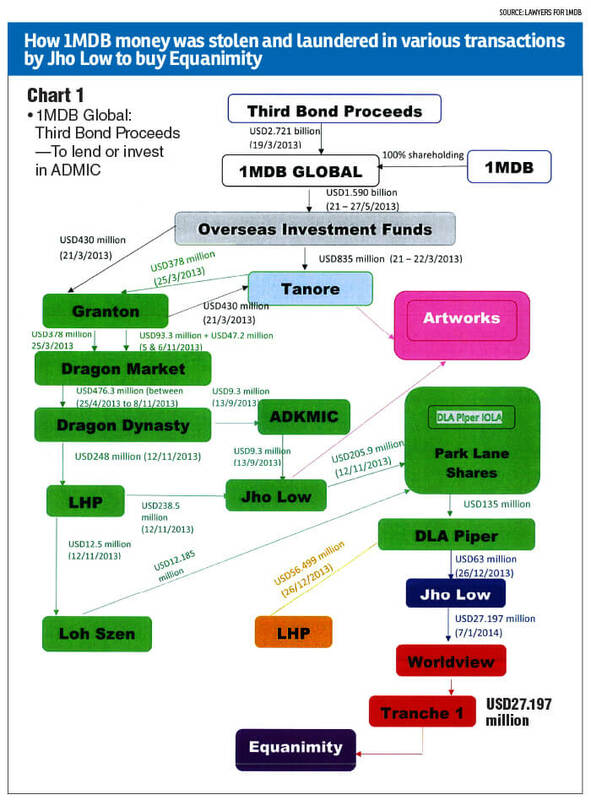 The DoJ filing also said Jho Low laundered over US$200 million in misappropriated funds traceable to 1MDB’s 2013 bond sale into a US account belonging to US-based law firm DLA Piper. 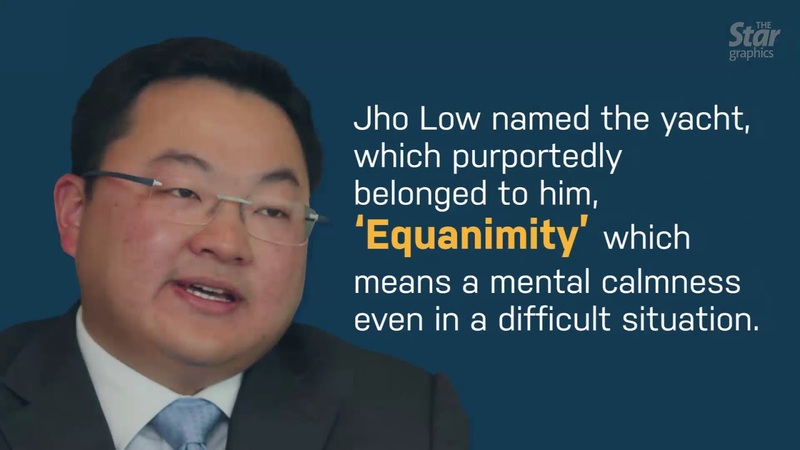 The US$29.1 million second payment for Equanimity made on Feb 5 and 18 as well as April 2, 2014 was part of the US$56.5 million that went from DLA Piper’s account to LHP — who with Jho Low participated in the Condor joint venture (JV) through Strategic Resources (Global) Ltd (SRG) to acquire Houston-based Coastal Energy with International Petroleum Investment Co (Ipic) and Ipic’s Spanish unit Compañía Española de Petróleos SA. The first and third tranches of payments for Equanimity made on Jan 7, 2014 and April 11, 2014 originated from US$2.72 billion bond proceeds raised in March 2013 by 1MDB Global Investment Ltd, which found their way to another Jho Low-linked offshore entity, Tanore Finance Corp. The bond proceeds were intended for a JV with Ipic’s unit Aabar Investments PJS called Abu Dhabi Malaysia Investment Co. But instead of funding the Tun Razak Exchange development, the cash ended at Tanore instead. The money in the Tanore account was also used to buy artworks and the Park Lane hotel in New York, according to the DoJ filing. When questioned by reporters yesterday, former prime minister Datuk Seri Najib Razak said he has never been on the Equanimity and has no knowledge that the yacht was bought using 1MDB money. “Why we didn’t pursue [to get back the yacht] earlier [was] because we were interested in the full settlement with United Arab Emirates on Ipic … that is worth much more than this Equanimity. That is the biggest sum; we wanted [this] big settlement to be settled first, that’s why we didn’t pursue the yacht,” Najib said, adding that the Equanimity “is being used as a populist move”. “I have no knowledge whatsoever as to the yacht and also the yacht itself is subject to litigation. It’s not a clear-cut matter,” Najib added. PETALING JAYA: Equanimity could smash the world record for the most expensive superyacht ever to be sold at auction in the event it goes under the hammer. With the vessel now in Malaysian custody, all eyes are on the fate of the luxury yacht reportedly worth US$250mil (RM1bil). Finance Minister Lim Guan Eng had said on Monday that his ministry wanted to get the best value from the Equanimity. “Our aim is to draw back as much money as we can from the asset,” Lim had said, adding that the immediate plan was to ensure that all paperwork was in order and that all proper controls were imposed. An online search of prices fetched so far by superyachts suggest that Equanimity could create a new record if the government decides to initiate an auction. An article on the website of British publication Boat International listed the sale of the 72m Lürssen Apoise as the most expensive yacht ever auctioned. At an auction in 2010, the yacht was sold for US$34.75mil (RM164mil), which is much lower than what Equanimity could be worth. VesselsValue, a London-based online ship-­valuation database firm, when contacted, said it valued Equanimity at US$175mil (RM712mil). “Looking through our system, we also have the Apoise as the superyacht which has achieved the most at auction,” said Vessels­Value associate director Claudia Norrgren. The Apoise and Equanimity fall under the category of a superyacht or mega yacht, which refers to a commercially operated luxury yacht which is over 24m long. Asked about the long term, Norrgren said superyachts don’t really go up in value. “If it goes for auction it never realises its full potential as it is a distressed sale,” she said, adding that there have been times when a superyacht could go up in value from its ordered price. “Pre-2018, people wanted a yacht imme­diately and there was a premium for very young superyachts, around one or two years old. “Nowadays, it is a pretty stable market for second-hand superyachts, with changes in value set by market depreciation rather than being influenced by economic factors,” explained Norrgren. The market for superyachts comprises the super-rich, also known as ultra-high net-worth individuals, said a luxury yacht broker. The broker said it was in the best interest for the government to keep Equanimity in good condition in order to sell it easily. The selling price of a used superyacht such as Equanimity, he said, would depend on a number of factors including how many people have been on the ship and used it daily. The broker said offering Equanimity for charter service could diminish its value. “The condition (of the yacht) will deteriorate. It will bring in charter income but the resale price of the yacht will be reduced,” added the broker. Despite its eye-watering value, Equanimity is not the most expensive when it comes to superyachts. In an online CNN article last month, which listed 10 of the most expensive superyachts, the top spot went to Serene, a 134m stunner that was reportedly bought by Saudi Crown Prince Mohammed Salman for US$550mil (RM2.24bil). In 10th position is Octopus, a US$200mil (RM814mil) vessel commissioned by Microsoft co-founder Paul Allen.